[ Sheridan Morley, author and broadcaster. ] Two Autograph Letters Signed, two Typed Letters Signed and one telegram to theatrical bookseller Barry Duncan, with carbon copy of one of his letters. Two of the letters on letterhead of 5 Peckarmans Wood, London, SE26, and the other two (on cancelled BBC letterheads) from the same address. All six items from 1970. The six items in fair condition, with light signs of age and wear. The four letters all with Morley's expansive signature ('Sheridan Morley'). [ Anthony Ashley Cooper, 7th Earl of Shaftesbury. ] Autograph Letter in the third person to 'M de Boinville', complaining of 'want of leisure'. On letterhead of St Giles's House, Cranbourne, Salisbury. 17 January 1856. 2pp., 12mo. In fair condition, on lightly-aged paper. He assures de Boinville that he 'much regrets his want of leisure to peruse the MS. that M de Boinville has been so good as to send him'. He concludes with the complaint that he is 'really so occupied that heh has not time for the discharge of the several duties that are imposed upon him'. 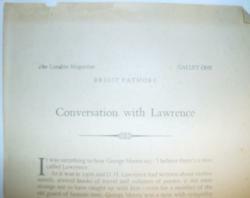 Galley proofs of an article in the London Magazine, entitled 'Conversation with Lawrence'; with a Typed Letter Signed by Lawrence's biographer Edward Nehls, and covering letter by Barbara Cooper, assistant editor, London Magazine. Proofs of an article appeared in the London Magazine for June 1957. Nehls's Letter: 7 June 1957; Urbana, Illinois. 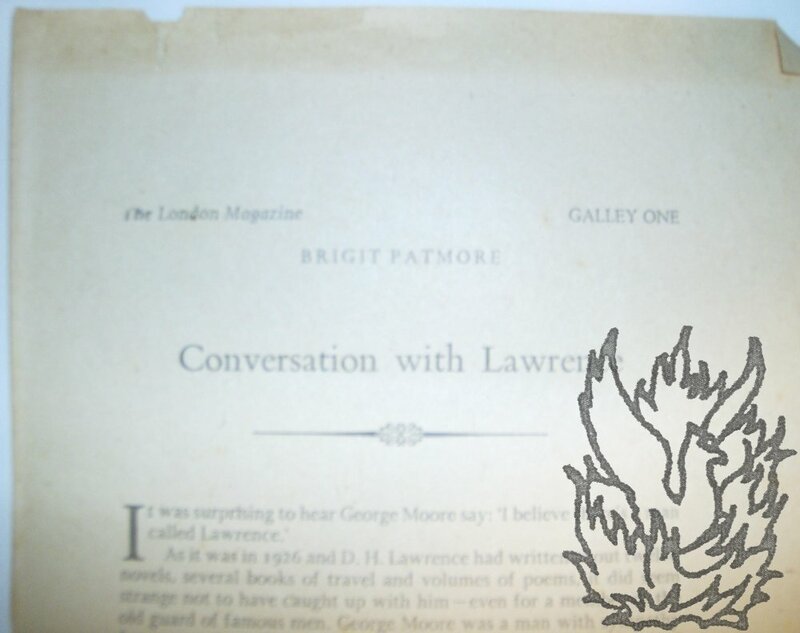 Cooper's Letter: 18 June 1957; on letterhead of the London Magazine. The proofs are on one side each of five strips (each approximately 60 x 15.5 cm) of discoloured high-acidity paper. They are in good condition, with a little light creasing, and slight chipping at head of first strip (not affecting text). They are headed 'GALLEY ONE [TWO, THREE, FOUR, EIGHT]'. Text clear and entire. The article reads continuously, with no hiatus between Galleys Four and Eight. Some simple errors indicate that these are early proofs, i.e.